SAFINTRA RWANDA LTD is A Proud member of the Safal Group, which has 36 metal coating and roll forming operations across Eastern, Central and Southern Africa. 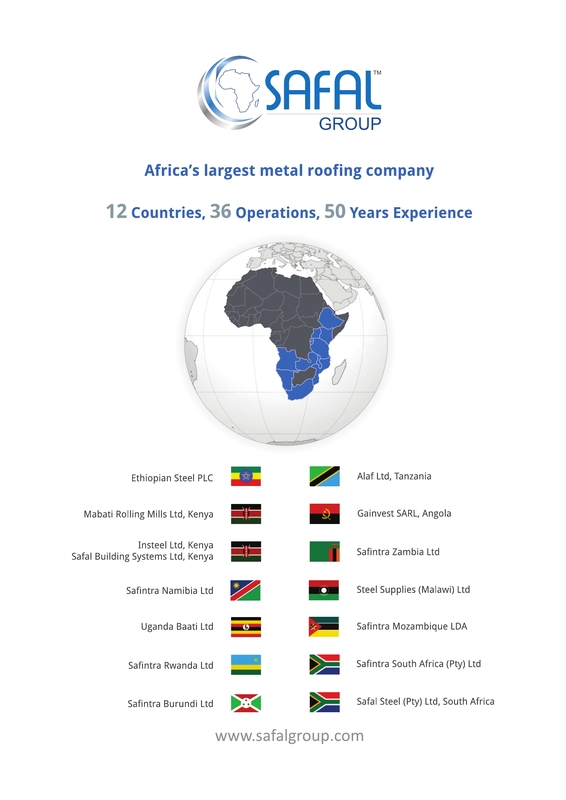 The Safal Group is Africa’s largest producer of steel roofing and sheeting and was the first producer of Aluminium Zinc coated steel on the continent.With over 36 businesses, and insights gathered over 50 years, the Safal Group has remained at the forefront in developing and providing products that lead the industry. To complement its roofing brands, specialist products have been developed by the Safal Group – such as the Fixtite fastener products, steel pipes and hollow sections, and other value added accessories for the building industry. Steel is uniquely placed to help communities across Africa meet the challenges of development in a sustainable, responsible manner and at the end of its life, steel is 100% recyclable – helping minimise the impact its processes have on the environment and on our precious planet. At all its plants, the Safal Group’s manufacturing processes are designed and managed with sustainabiilty in mind and therein aim to minimise emissions and waste whilst maximising Energy efficiency.